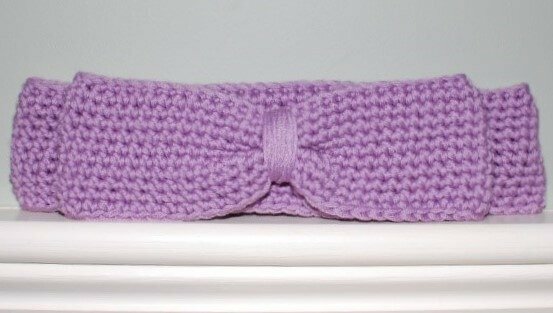 This easy bow headband crochet pattern is super cute and easily adaptable for any season. Work it up in cotton for a summer friendly look or in a wool blend to use as an ear warmer in colder months! approx. 14 sts and 18 rows = 4 in. Ch 63 (66, 70). Being careful not to twist the chain, join with a Sl st into the back ridge of the furthest chain from hook. Round 1: Ch 1 (does not count as st here and throughout), work 1 sc in the back ridge of the same chain as join and into the back ridge of each chain around, join — 62 (65, 69) sts. Round 2: Ch 1, work 1 sc in same stitch as join and in each stitch around, join — 62 (65, 69) sts. Rounds 3 through 9 (11, 11): Repeat Round 2. Ch 53 (56, 60). Being careful not to twist the chain, join with a Sl st into the back ridge of the furthest chain from hook. Round 1: Ch 1, work 1 sc in the back ridge of the same chain as join and into the back ridge of each chain around, join — 52 (55, 59) sts. Round 2: Ch 1, work 1 sc in same stitch as join and in each stitch around, join — 52 (55, 59) sts. Flatten cylinder just made and wrap yarn from your skein around the middle of the cylinder to create a bow, keep wrapping until desired effect is achieved. Fasten with a knot in the back of your bow, weave in ends. Using a tapestry needle, sew the back of the bow in the desired location on the head band.